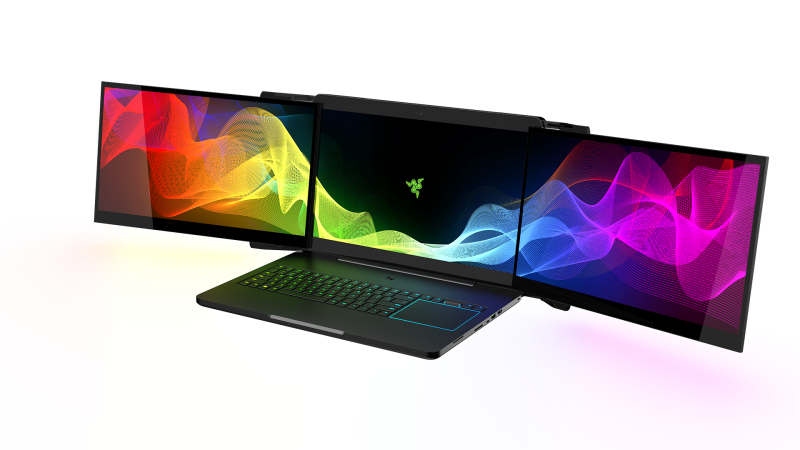 Two prototype models of Razer's first of its kind three-screened gaming laptop have been stolen from its booth at the CES 2017 tech show in Les Vegas, according to the Razer PC maker. Company CEO of the company, Min-Liang Tan, confirming the thefts on the last day of the show, said: "We have filed the necessary reports and are currently working with the show management as well as law enforcement to address this issue." Razer had plans to go commercial with the laptops soon. This will make them the first company to come out with such an innovation. This has prompted Tan to condemn and indicate that it could very well be part of corporate espionage via their Facebook post which states "We treat theft/larceny, and if relevant to this case, industrial espionage, very seriously – it is cheating, and cheating doesn't sit well with us. Penalties for such crimes are grievous and anyone who would do this clearly isn't very smart"
Reports widely believe the stolen laptops are the Valerie model developed under the name Project Valerie and comes with three 17.3 inch screens that can be unfolded and placed beside the central screen. Each screen has 4K resolution making the combined resolution capacity of the laptop a staggering 12k (11520 x 2160 pixel) and also 180-degree field of view. In a statement to Kotaku, Razer detailed A $25,000 reward is being offered for original information leading to the identification, arrest and conviction of a criminal suspect. Razer, in its sole discretion, will decide who is entitled to a reward and in what amount. Razer may pay only a portion of the maximum reward offered. The decision will be based primarily upon law enforcement’s evaluation of the value of the information provided. When there are multiple claimants, the reward will be shared in amounts determined by Razer. Razer associates are not eligible for the reward. This reward offer is good for one year from the date it is first offered, unless extended by Razer. Information about the theft can be sent to legal@razerzone.com. Razer will not publicly disclose material that it receives or details about respondents, except to those persons with whom Razer is directly working to resolve this matter or as may be required by law. This is not the first time the company has faced such an incident. In 2011, two Blade prototypes were stolen from Razer's R&D lab in San Francisco.